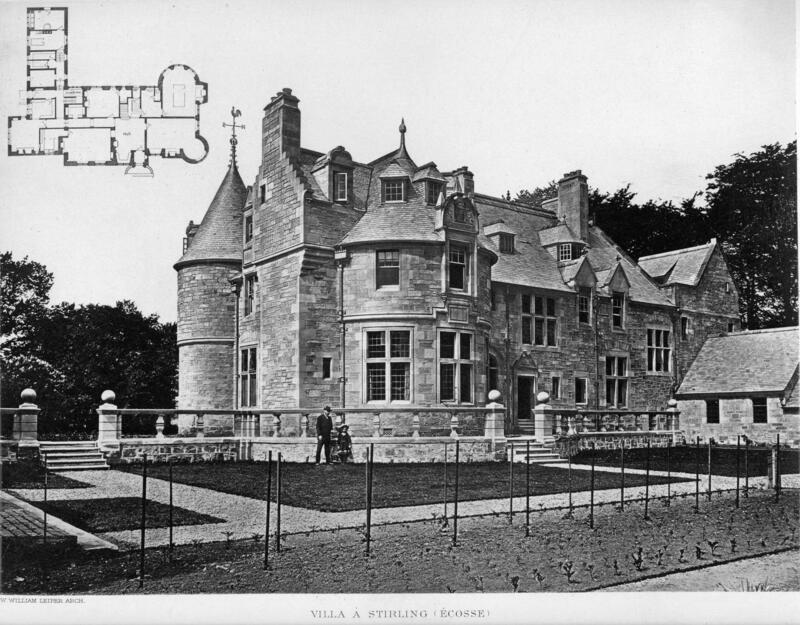 Langgarth is one of Stirling’s great villas, designed by the architect William Leiper (1839 – 1916). Built in 1897, it was originally one in a group of four on the St Ninians Road. The others were Viewforth (Stirling Council headquarters), Springbank (demolished to make way for Central Regional Council’s headquarters in 1995) and Annfield (also demolished). Langgarth was latterly used by Central Regional Council, and along with its little gatehouse, is now empty and boarded up. This illustration is from the French magazine L’Architecte, 1907 and was purchased for the Smith from ebay. It shows Langgarth in its early years. Leiper was an architect who paid as much attention to the laying out of the gardens and grounds as he did to the building, and the garden has yet to mature. The 1901 Census lists the owner of Langgarth as widower William Renwick, aged 61 with his son Thomas, 8, and daughter Bethea, 7. His sister-in-law and five servants made up the household, with gardener George McCall and his wife Ann in the Lodge. Renwick was proprietor of the sugar cane mills in Bengal, India. Leiper is an architect of outstanding importance with the design of buildings such as the Templeton Carpet Factory, Dowanhill Church and the City Chambers banqueting hall, all in Glasgow and many fine villas in Helensburgh. It would be a shame if Langgarth were lost to Stirling.